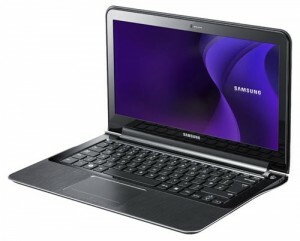 So, if you were following updates by Samsung in mid-May, you probably remember the technological juggernaut promising the 11.6-inch Samsung Series 9 laptop would be shipping soon. Well, Samsung has delivered on that promise as the new Series 9, otherwise known as the NP900X1A, has begun shipping in the United States on websites like Tigerdirect and Circuit City with a retail price of $1,159.99. If you are looking for a close competitor to the MacBook Air, then this 0.65-inch thick, 2.31 pound device with a +$1,000 price tag is your best bet so far. This little guy comes fully loaded with a ton of specifications that will give the MacBook Air a run for its money. For $1,599.99 you get an 11.6-inch, 1366×768 display, Intel Core i3-380UM 1.33GHz processor with Intel HD 3000 graphics, 64GB SSD, 2GB of DDR3 RAM, Bluetooth 3.0, 802.11 b/g/n WiFi, 1.3MP HD camera, WIMAX 4G capabilities, a 4-cell Lithium Ion battery and Windows Home Premium 64-bit as an operating system. There are also a few nice ports on the Series 9 including a micro HDMI, one USB 2.0, one USB 3.0, LAN via an optional dongle and a card reader. The device’s screen also has 340 nits of brightness and the keyboard is backlit which is always a nice feature if you find yourself working in the dark. The Series 9 looks very sleek with an all black finish and a thin, curved design that makes it appear very portable. If you are not an Apple fan (yes, we do exist), this is definitely a good substitute for the MacBook Air. The pricetag may push some users away but will ultimately draw in anybody looking for a suitable MacBook replacement. The Samsung Series 9 laptop is now available through Samsung, Amazon, Tigerdirect, Circuit City and a whole host of other retailers.